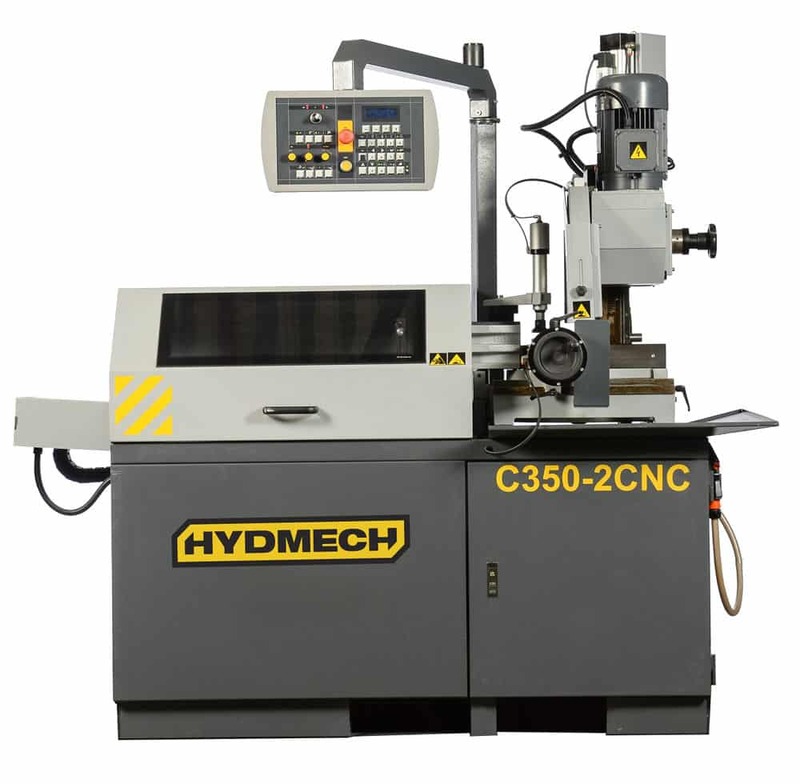 The HYDMECH C350-2CNC is a vertical cold saw that is perfect for metal cutting applications that have multiple lengths or quantities. A solid automatic metal cutting cold saw that will increase production and output at any metal fab shop. The HYDMECH C350-2CNC is an automatic vertical cold saw that is ideal for steel cutting jobs that require various lengths and adjustable quantities. 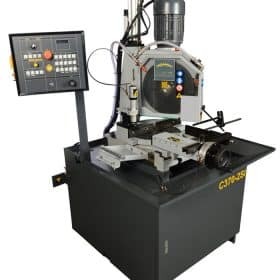 It miters from 60 degrees left to 45 degrees right and is also equipped with a 23’’ single stroke, a multi-indexing feed system and also features 4 different blade speeds. 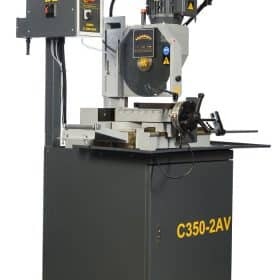 The C350-2CNC features a 4 1/2’’ round hollow capacity, a 14’’ blade and a 2.5/3.5 HP motor and is suited for quick, clean, multi-length metal cutting. Has a heavy duty gearbox with dual stage transmission and that provides four blade speeds of 15-90 rpm. 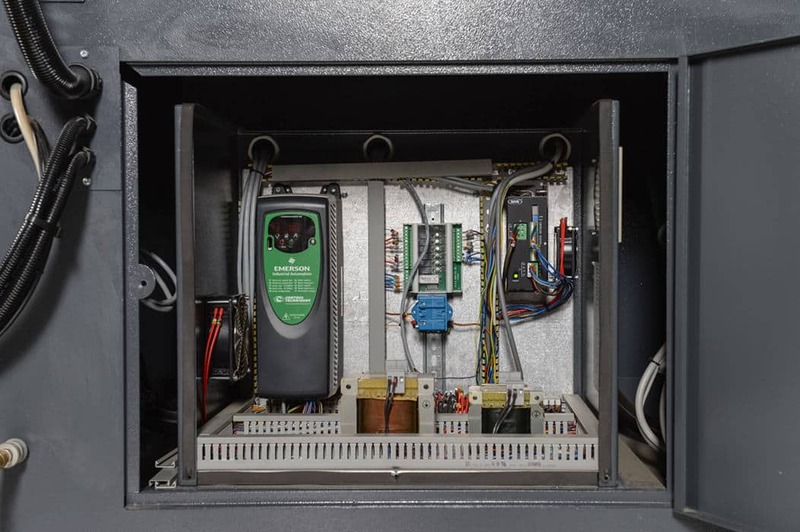 Has a control dial for the saw head feed rate. 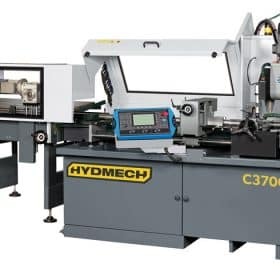 Has a microprocessor used for programming multiple cutting lengths and has the capability to store up to 99 jobs. Has an enclosed steel base with a chip drawer and a coolant tank. Has a programmable sawing stroke. Has a shuttle vise with 23’’ stroke that is controlled through a ball screw and a d.c. Motor. Has pneumatic operating vertical vise. 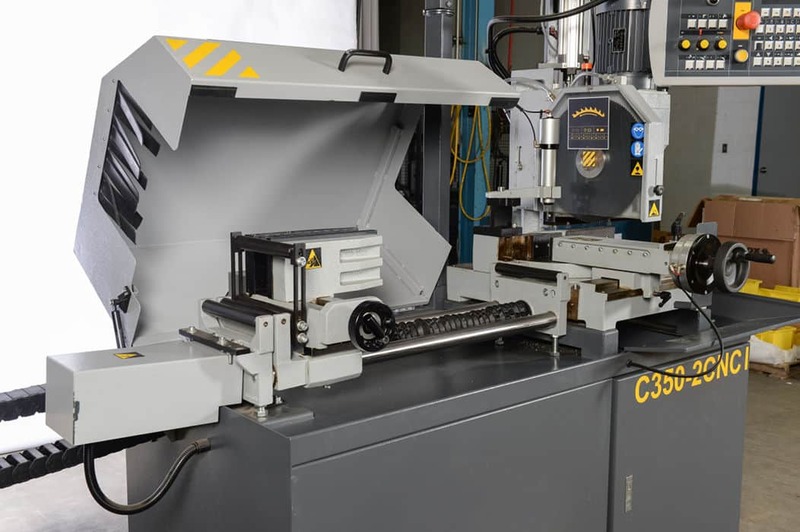 Has a pneumatic operating vise that has an anti-burr clamp used for double clamping material. 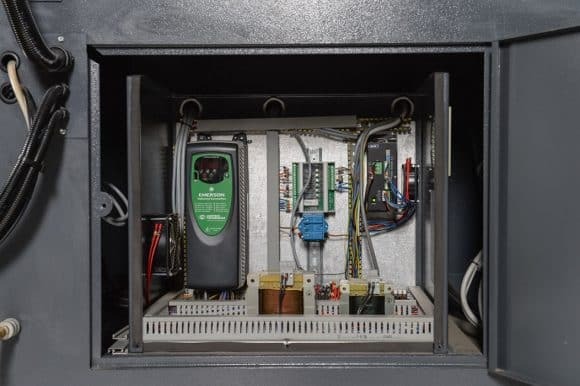 Has a flood coolant system with an electrical pump. Has a wash down hose. Has a wire chip brush. 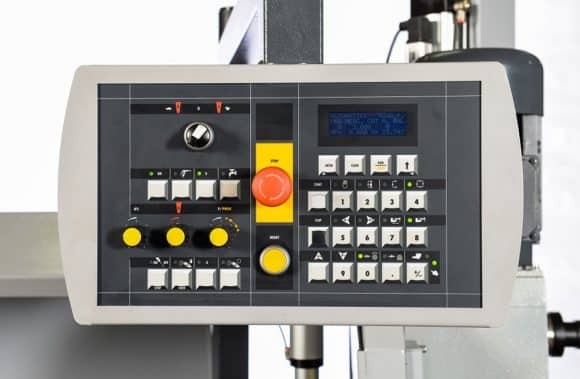 Has an ergonomically positioned control panel, that includes a main disconnect, a programmable sawing stroke, a digital display that indicates the machine diagnostics and operations such as the blade speed and cutting time. Has 350 mm cold saw blades. Has a K40 roller table.